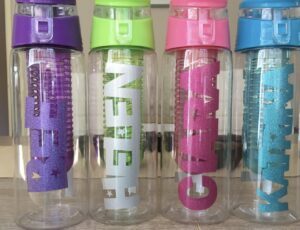 Home Blog Posts Performing Arts Classes in Hampshire NEW Personalised TADAA Water Bottles! NEW Personalised TADAA Water Bottles! We have Adult Fruit Infuser Bottles available in purple, lime green, pink and turquoise. We are very excited to announce that we now offer TADAA Water Bottles! 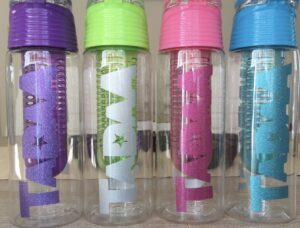 Each bottle has the TADAA logo printed on one side and your choice of name on the other. You have the choice of a children’s size bottle or a larger adult size and all bottles are of high quality. Child size bottles are available in pink or blue. Adult size bottles are available in either purple, pink, lime green or turquoise and they come with a fruit infuser. You can also choose the colour of the writing, including various glitter options. Child size Water Bottle is available for £6. Adult size Water Bottle is available for £8. If you would like one, please contact us with your desire bottle size, colour of the bottle, colour of the writing and the name you would like printed on it. Bottles can be personalised with your choice of name. Why not check out our TADAA Merchandise Page and see what other items we have on offer? We would like to thank Create Me That Ltd for supplying our bottles.